I read somewhere that jet lag is only a problem when you cross time zones from west to east, but that is just rubbish. We got home on Friday and my body clock is still ticking away on Thai time. What with wonky biorhythms combined with a twenty degree drop in temperature and the usual post holiday malaise, it has been a depressing few days, but hopefully I’m coming out the other side. 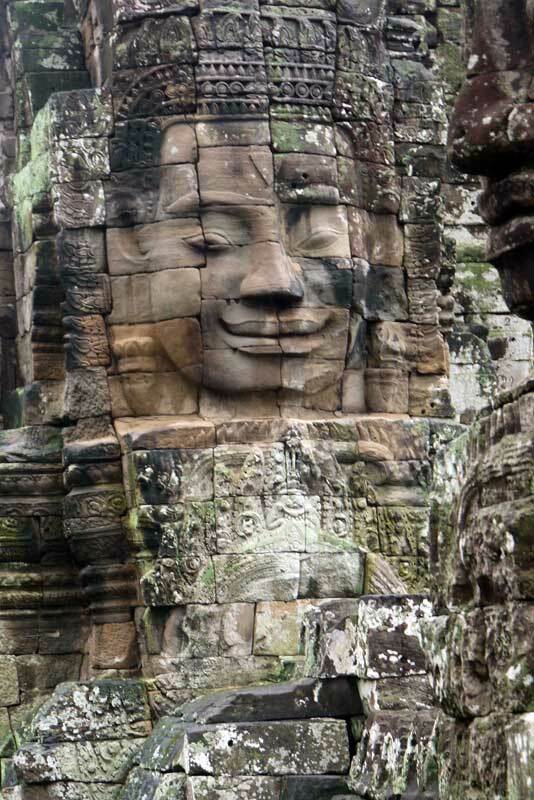 At least I’ve begun the task of sorting out the thousands of photos I took while I was was away which prompt me to pick up the retrospective account of our tour of Cambodia and Vietnam with one of the highlights of the trip – the temples of Angkor Wat. We weren’t at our best that morning. Our room at the Freedom Hotel in Siem Reap was the only one we came across where the air-con didn’t work and it had been a restless night sleeping in an oven. The mood didn’t lift when we went outside and saw that it hadn’t rained hard overnight and was drizzling still. Getting caught in a downpour in the east isn’t too bad because it is more like a warm shower, but a white sky doesn’t help with a camera. And then there is the humidity. 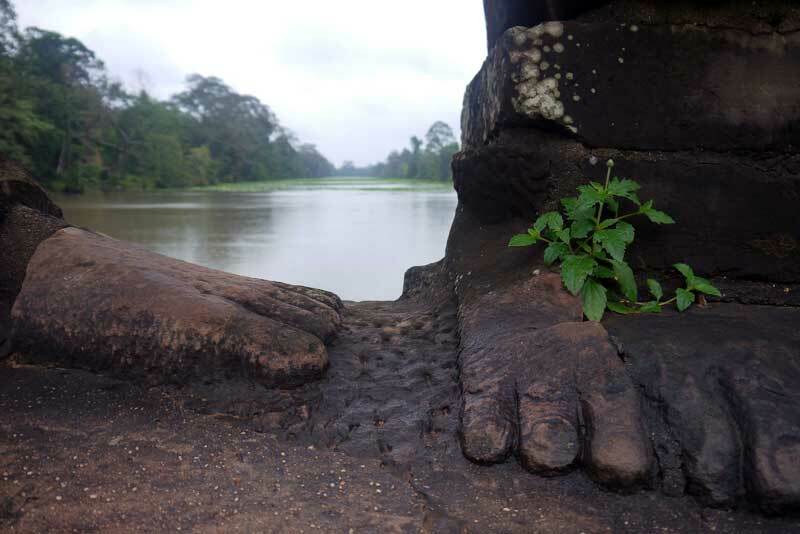 We got to Angkor Wat early to collect our two day passes, but it felt almost like we were swimming our way to Angkor Thom. 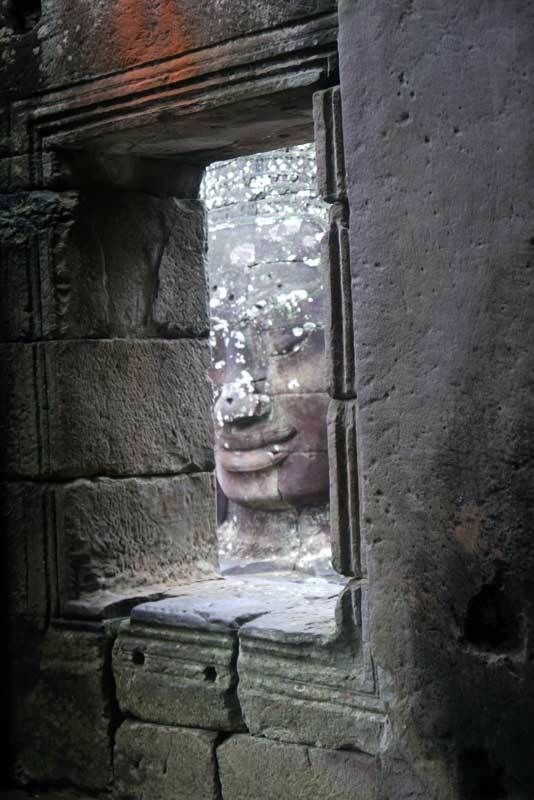 I don’t propose to write too much about the temples themselves – you only have to Google Angkor Wat to find out more – and will confine myself to our experiences of the day. It was hard to tell what made us wetter, perspiration or the rain, as we clambered through the maze of passages and climbed up and down stone steps. Then there are the crowds. 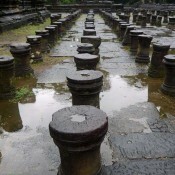 Hardly any foreign tourists visited the temples ten to fifteen years ago. 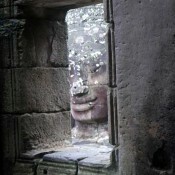 Now it is something like three million a year and rising all the time, particularly the Chinese who own many of the new five star hotels popping up in Siem Reap. It is a worry as most of the masonry you see is carved out of soft sandstone and we were amazed that so much of it is still standing given the amount of rain the region gets, let alone millions of tramping feet. There is a film on the issue over at the BBC. Which is a bit rich of me since I was happy to plant my size eight Crocs all over this unique monument, but then I had paid my £40 for my two days of desecration to get sneaky photographs like the one at the top of the page of the Thai dancers who don’t seem too impressed by the weather, but cheered up enormously when paid to pose for the camera with tourists. 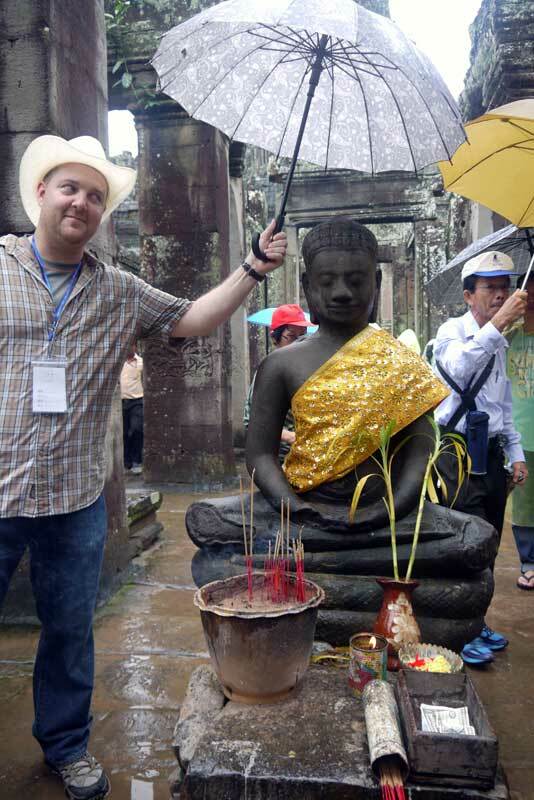 And it was hard to be put off by the rain in such a place, even if the French-Canadian American Nick needed to shelter Buddha from the elements. 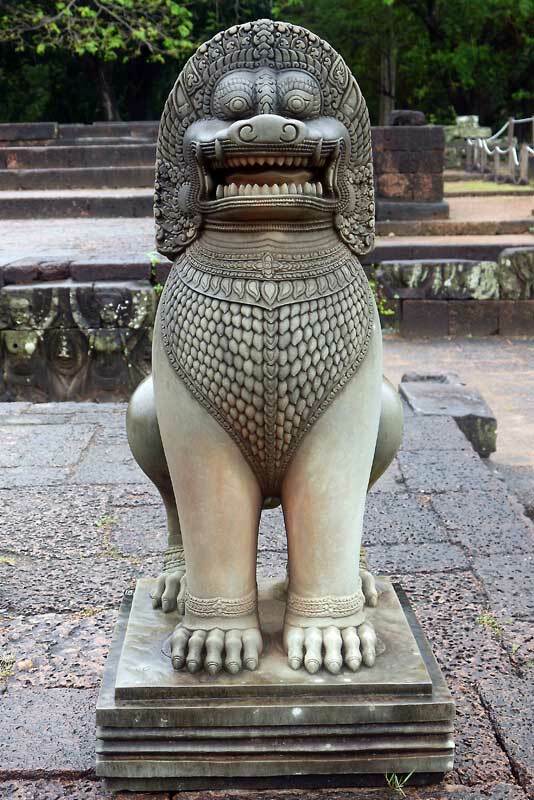 Having emerged from the north exit of Bayon we made our way across the long land bridge to the Baphuon temple. 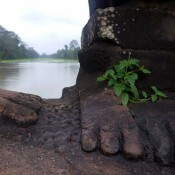 Built in the 11th century, it is an impressive and tranquil place, especially if you climb to the top of the ziggurat-like structure, but by now the heat and humidity were taking their toll and me and Mrs P decided to forego that pleasure, exploring the lower area instead. That is where I took the photo on the left and you can see the evidence of the rain, although it it had stopped by then, even if the moisture still filled the air. It was at this point that our guide, Tia, lost the rest of the group. 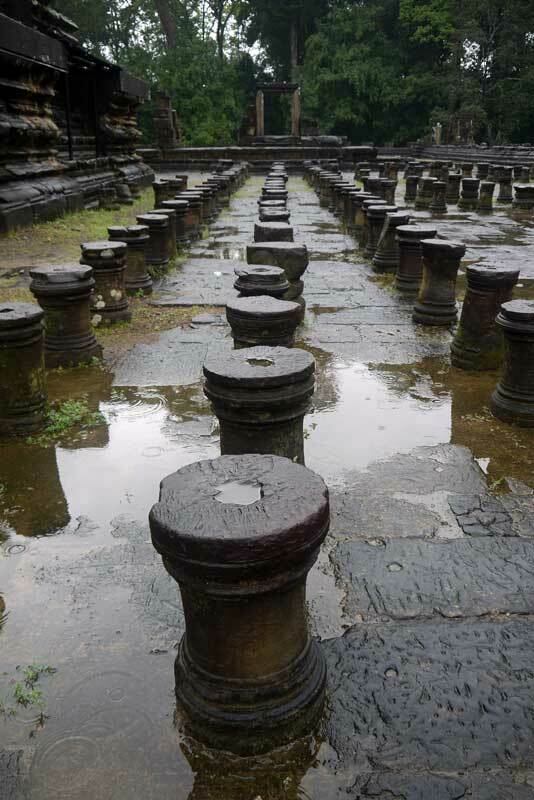 It shouldn’t have been possible as there was just one way in and out of the temple – over the bridge – but they seemed to have vanished into thin air from somewhere on the temple roof. 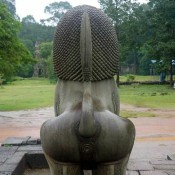 I’m not entirely sure how they managed it, but they had found their way on to the terrace of the neighbouring Phimeanakas temple. 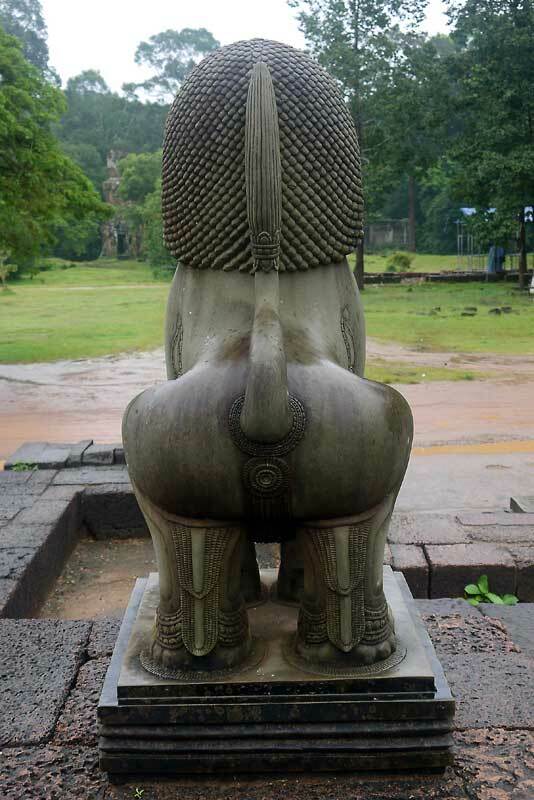 I must admit that I wasn’t paying close attention because I was photographing the reproduction lion statue above left, as well as the rear view right which you can see is.. ahem.. anatomically correct. Meanwhile, Tia had gathered her lost sheep together apart from the Aussie couple, Adrian and Kat, who eventually turned up clutching a couple of tinnies each. They could always be relied upon to find beer no matter where we were. And with prodigals’ return we retired for lunch which is as good a place as any to take a break from the narrative. Nice! I particularly like the Ko Samet shots; so evocative, and so gloriously HOT :)). 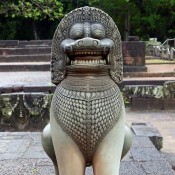 When I visited the temple complexes in July 2011 the weather was immaculate and there were very few tourists around. 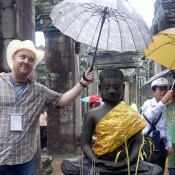 I wandered freely amongst the temples and then found my tuk tuk man before travelling on to the next wondrous site. I feel privileged to have witnessed this magnificent zone – that should certainly have been included in “The Seven Wonders of the World”. Welcome Home Mister Sixty! 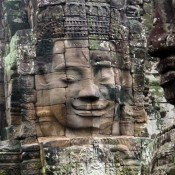 Thank you and I agree that Angkor deserves a place in the world’s wonder, not least for the endless wall carvings. You must have been lucky in July – isn’t that the rainy season? No, the rainy season is in October – apparently!